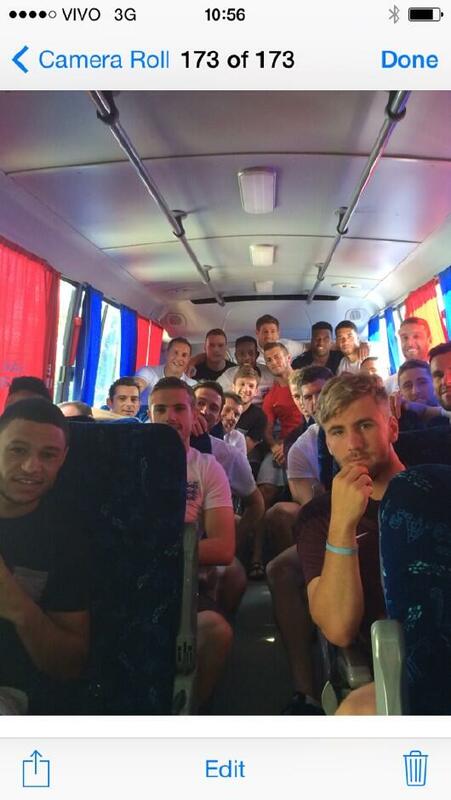 The England squad has arrived in Brazil ahead of the World Cup Finals. England striker Daniel Sturridge has posted a photo of the squad travelling on the team bus ahead of their World Cup game against Italy tomorrow. The photo shows Alex Oxlade-Chamberlain with Luke Shaw posing at the front, while the senior members of the team on the back row include captain Steven Gerrard and defender Phil Jagielka. Manchester United forward Danny Welbeck has emerged as a doubt for England's World Cup opener against Italy. Welbeck reportedly suffered a leg injury and limped out of Tuesday's session, making him a doubt for the Three Lions' first Group D game against Italy on Saturday. The Football Association refused to comment on Welbeck on Tuesday evening. England manager Roy Hodgson said the emergence of young players was "very exciting" but warned that they would have to perform at the World Cup in Brazil. At a press conference in Brazil's capital Rio, he said: "We have options. The future looks bright, there are exciting times ahead." But he added that the team still needed experience. "Before we build up, let's see some performances," he said. Television screens will stay on and kettles will continue to boil despite a record power surge predicted in the extremely unlikely event England win the football World Cup this summer, Energy Minister Ed Davey has said. The Energy Secretary says he has been assured by National Grid that the UK has enough electricity generating capacity to meet what might be the highest domestic energy surge ever if the England team made it to the final of the football World Cup in Brazil. England's footballers have been trying out a few new moves as some players joined in a display of the Brazilian martial art Capoeira. It was part of a push to win over a few new fans in one of the city's favalas, or shanty towns, home to some of its poorest 70,000 people. Manager Roy Hodgson has encouraged players to experience who and what is around them. Former England midfielder David Beckham has said he is optimistic about England's chances in the Brazil World Cup. He said the players in the national team would be expecting "to go all the way" adding that it did not matter how young they were because they are "ready and prepared". Becks added that forward Wayne Rooney would also be ready "without a doubt" and said that was because every time he puts on an England shirt "you know it means something". In preparation for Thursday's kick off, a pub in Tyneside has decked itself in England flags as well as those of other competing countries. Pub landlord Norman Scott told ITV News Tyne Tees he will take each country flag down as it is eliminated. He did not speculate when he would remove the England flags. A subway strike has snarled traffic in South America's biggest city and added to widespread concerns about whether Brazilian authorities will be able to prevent street protests and other simmering labor disputes from disrupting the Cup. Now in its fifth day, shortly after the early morning rush t the Ana Rosa subway station in Sao Paulo, the state metro company said it had fired 60 striking workers, a move some feared could increase tensions further. A local court had ruled on Sunday that the strike was illegal. Earlier, Brazilian police used tear gas on Monday to disperse metro workers on strike in defiance of a court order to return to work, causing major traffic congestion just three days before the city hosts the opening match of the World Cup soccer tournament. Stunning views of England's beach side pitch in Rio, Brazil have been released showing the conditions the national side are training in. England players showed their gratitude by holding up a sign, which reads 'thank you Brazil for the warm welcome'. Brush up on your football knowledge ahead of the World Cup with some of the key stats about the 32 teams vying for glory in Brazil.